Being a hero could cost her everything… Ever since Alice was saved from her abusive father, she’s wanted to be a hero. But in 1960’s Jet City, women are supposed to want marriage and babies, not cowls and secret identities. When Alice’s beloved aunt is brutally murdered by a new crime syndicate, she takes up the mantle of the Serpent, a heroine who has been protecting Jet City for decades. Fighting alongside the masked vigilantes American Steel and Shadowmaster, Alice vows to bring her aunt’s killer to justice. But one mistake unleashes a nightmare villain. One who will stop at nothing to take control of the city and kill anyone who stands in the way. Can Alice survive the battle and become the hero she was always meant to be? Or will the price be too much to bear? Will Alice find the price of survival and heroism too high? Trish Heinrich, the author of the world of urban fantasy and superheroes in ‘Serpent’s Sacrifice’ has kindly joined me today to explore Alice’s journey. Trish, where did this journey start for you? A song from the geek rock band Kirby Krackle called “Needing a Miracle”. I had originally envisioned the story following along the similar lines as the song; a Lois Lane type in love with a Superman type. But then I asked. “What if Lois Lane was also a superhero?” and it took off from there. It really sounds like the story kicked off from this idea of a female superhero. How did her supporting cast come to life? Mostly as I cooked dinner and wiped butts! LOL But seriously, kind of like that. I would lose myself in my imagination as I did all the household tasks of a stay at home mom and soon they were real to me. As you were thinking about your characters when you were doing the household tasks, did it mean that you were thinking about household tasks when you were writing? Or was there something else at the forefront of your mind? And when you were focusing on the characters and how their lives fit into the central superhero journey, did you find yourself injecting little aspects of your life into the tale? Not really, no. Except maybe my love for superhero stories. Superhero stories are pretty awesome. And being a lover of them I’m sure you’d previously read enough of them to know how they deliver messages to the readers. What was the most important thing you wanted to readers to take from your slant on a superhero story? I wanted to show a real, flesh and blood woman as a hero; with all the flaws and strengths that any other hero might have. I wanted her to be strong and yet compassionate, I wanted an older woman mentor to show that it doesn’t always have to be a man mentoring a woman. Now that I think about it I’m only able to draw on a few examples of an older female in a mentoring role. Good work for recognising the gap for female mentors in the market. And one of the biggest ways females can mentor others is by sharing what they’ve learnt. What were your biggest learning experiences while writing this book? So many! Maybe that I have more guts than I thought, that I can do this and still be a good mother and wife and friend; even though that’s hard. The best things in life are hard, but they are also worth it, and I’m sure you can be a great mother, wife, friend and writer, but perhaps your books might just be released a little more slowly. Other than finding out that you had more guts than you thought, what felt rewarding to you about working on this writing project? The accomplishment of it, proving to myself that even as a mother of two small kids I could write (and rewrite and rewrite) this book and then also publish it. What are you techniques for writing with two small kids? There’s nothing wrong with a paper planner, I have one too. It’s just so much more satisfying crossing off items on a paper to-do list than a digital one. What do your editing appointments look like in your planner? Are these appointments reminders for you to edit yourself, or do you pass editing to a third party? I give the book to my developmental editor, then take the notes and revise, then send it to my final editor and then revise again. Do you feel that you’ve seen a progression of your writing and voice as you have continued to edit and revise your work? I’m not sure yet, ask me next year! Will do! As you’re still working on your author voice I’d love to know if you’ve already turned your attention so far towards branding your voice. Have you thought about it and the direction of your writing career? Yes. I thought about how I wanted to be perceived, and a lot about the kind of stories I want to tell. I knew that I wanted to tell stories of female heroes in any genre that had agency, that had compassion, guts, and were flawed. I knew that I wanted to surround them with diverse characters with equal depth. I have found a lot to love about the world I’m creating within that scope. Serpent’s Sacrifice is the first in a series, so we know there’s much more to this world that we’ve seen so far. What writing projects are you currently working on in this world? The third book in The Vigilantes series, as well as a superhero ebook boxed set. What is it about writing that has drawn you to continue to the third Vigilantes book as well as spinning out another ebook series on the side? Because I love, love, love telling stories. It’s what I was meant to do. You just have to do what you are meant to do! And I hope that by doing what you’re meant to do you find the storytelling process easy. Do you usually find the plot for your stories before you start typing, or do you launch into writing and see where you end up? Generally yes. I have a beginning and end in mind, sometimes also the saggy middle. I do a little outlining, mostly story structure and then I go for it! And when you go for it, which of your hand is in charge of getting everything done, right or left? And because I know you love superheroes, can you settle a question that I’ve been posing to some of the other authors recently, what happens if Batman gets bitten by a vampire? Actually, that happened in an alternate story of sorts, he became a literal bat, with fangs and everything. I wonder if he becomes a person-sized bat or a standard sized bat? Either way, I’m sure he probably became a vampire bat, but I will have it check it out to make sure. Before I investigate any possible vampiric fate for Batman, I was wondering if you could play the part of the wise woman and share your top tips for other authors looking for a little mentorship and guidance? Learn the basics of marketing before you publish, and try to have more than one book ready to go so you can build on the momentum. With your third book in this series underway, you’re well into the depths of building momentum for your work. Trish, I wish you the best of luck continuing to work on your groundswell of support and I hope we’ve managed to entice a few new readers to pick up a copy of ‘Serpent’s Sacrifice today. Excited to read the book we discussed today? Find it here on Amazon: ‘Serpent’s Sacrifice ( ASIN: B075PLKZT5 )‘. 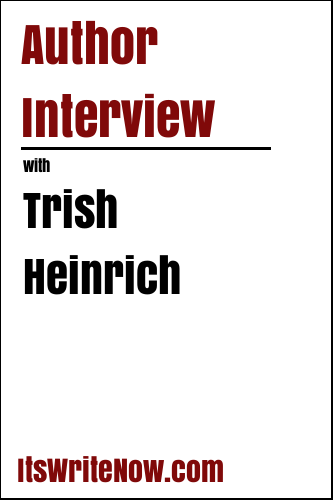 Want to find out more about Trish Heinrich? Connect here!